This morning at about 6am, my neighbors were getting out of bed and the floorboards squeaked like crazy. I fell back to sleep much later and woke up for breakfast after 9am. I tested out the 0% lactose evaporated milk I bought from the supermarket. I made lactose-less kopi C and it tasted well. I’ll write a full report for next Friday. Stay tuned! After breakfast, I decided that I need to start planning my trip to Machu Picchu. I only have 2 weeks left in Peru and I don’t want to screw up my main reason here in South America. I talked to the little travel table at the hostel. The guy quoted a US$270 package from Cusco to MP and back. He also said it’s quite easy to book the tickets myself. So I started checking out the sites for trains to Machu Picchu’s nearby town–Aguas Calientes–and the tickets for the site. Booking train tickets were a bit tough too. The original date that I plan to go did not have cheap return train tickets so I pushed everything to one day later. For now, I have my return train tickets from Ollantaytambo to Aguas Calientes but not the entrance tickets to Machu Picchu because I needed to pay the entrance fee at a bank. I plan to buy the entrance tickets when I get to Aguas Calientes. After the tiring ticket buying, I set off to take the bus to the supermarket near where I used to stay with my homestay family. 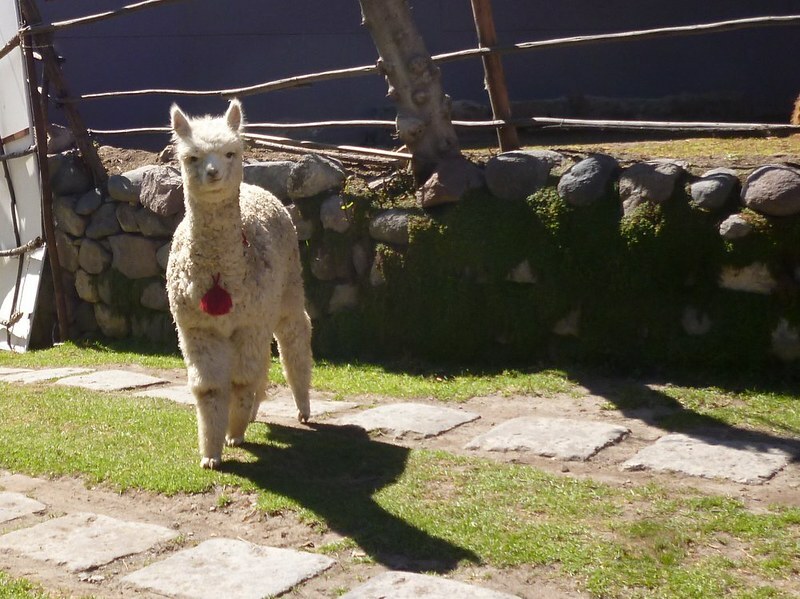 I walked all the way down Santa Catalina and realized that I was only 500 meters away from the cute baby alpacas. My feet decided to carry me to Mundo Alpaca. I was not sure how Milk (the white baby alpaca) escaped from the pen but it was calmly grazing and eating the tips of the flowers when I spotted it. I never got to pet it because it kept running away. 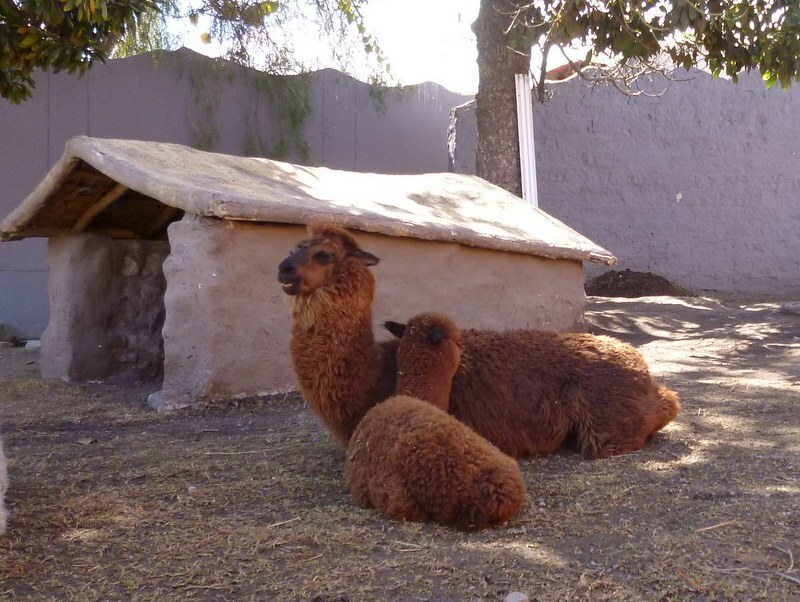 I saw baby Coffee (the brown baby alpaca) resting its neck on a bigger alpaca which I hope is its mom. They were so cute. 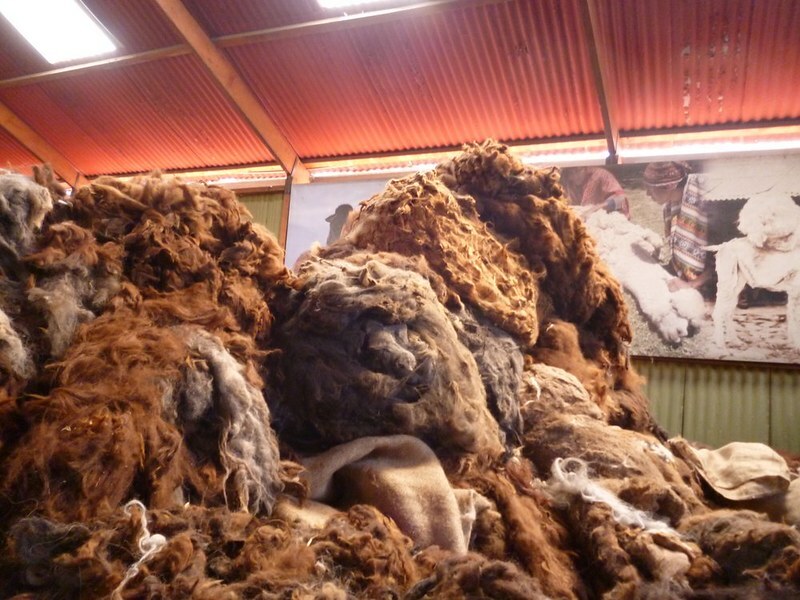 At Mundo Alpaca, there’s also loads of sheared alpaca wool. I snuck away one pinch of it. Shhh! After Mundo Alpaca, I walked back to the main street for the bus. Luckily, I found one which had an empty front seat. The traffic on the main avenue was quite bad and the bus crawled until I reached my stop. 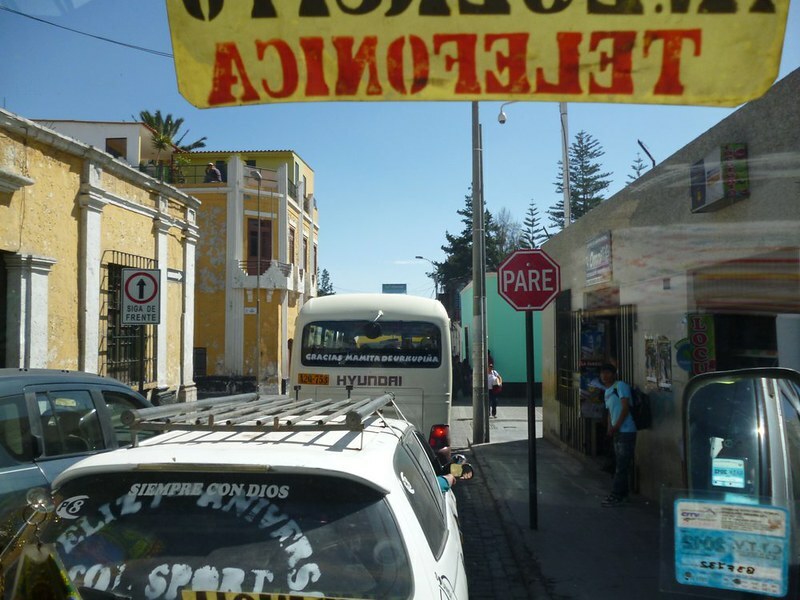 View of Arequipa from the inside of a combi. After having a ceviche at a restaurant recommended b one of the teachers, I headed to the supermarket where I couldn’t find cheap cotton pads. Can you imagine, one cotton pad here costs S$0.35. That’s quite expensive! I was hungry for something else so I stopped by the supermarket cooked food area. I was horrified to find out that the lady reheated my chicken drumstick in the microwave on a Styrofoam plate. After the meal, it was time to head back to the city center. It took a long time before I found a relatively empty bus (meaning it’s not crammed from the front to the back with human bodies) and I got on. A quick summary of the rest of the day: quick walk to the market; watch Batman Return in Spanish; have dinner; head back and blog.